Remain campaigning the day before the referendum vote. Geoff Caddick / Press Association. All rights reserved.It is becoming clear that Labour faces a potentially fatal dilemma over its response to the Brexit vote, and above all to the question of the free movement of people across borders. The deadly standoff between Jeremy Corbyn and the majority of the Parliamentary Labour Party is supposed to be about this issue, but sadly neither side offers a clear way forward. Out of this hour of abject Tory failure will either come a prime minister who supports Brexit (Michael Gove or Andrea Leadsom) or more likely one who failed to campaign against it and opposes the European Convention on Human Rights (Theresa May). There is a huge opportunity for Labour if it does what oppositions should do: oppose. The 48 per cent who voted to stay in the EU - more if we count disillusioned Leavers - are looking for leadership. The last thing they want is a precipitate triggering of Article 50, as Jeremy Corbyn suggested. They want Parliament to do its job and secure the best European relationship possible. Labour has to get free movement right or face probably critical losses among either Remainers or Leavers - or both. If it does not accept the implication of Leave’s success that free movement should be restricted, at least in respect of incoming labour, Labour risks alienating the minority (37 per cent according to the Ashworth poll) of its current supporters who backed Brexit - as well as driving ex-Labour voters in its heartlands even more firmly towards UKIP. However by failing to support free movement, Labour risks alienating the majority (63 per cent) of its current voting base and also the centrist voters - repelled by Tory irresponsibility over the referendum - who could give it the boost it needs to return it to power. A suddenly reinvigorated Liberal Democrats stand ready to siphon off Labour’s support in this direction. He failed to articulate a broad internationalist case for the European Union, restricting his support mainly to the narrow ground of ‘workers’ rights’. He presented the threat in terms of how the Tories would take advantage of Brexit to get rid of EU-guaranteed rights like maternity leave, not in terms of the very clear and present threat of Brexit itself to the free movement of people - one of the most precious rights of all for UK workers, students, pensioners and others, as well as for other EU citizens. He failed to react strongly to the outrageous racism of the official Leave campaign as well as UKIP. Surely despite his ambivalence over the EU, he could have led on this. He avoided a prominent place in the TV coverage of the referendum, failing to get major interviews (except for a late one on Sky) or a role in one of the big debates. He simply did not lead in the mass media, which is where the crucial exchanges were happening, but preferred to speak to Labour rallies. After the results, he was too quick to accept Brexit and urge the triggering of Article 50, instead of pressing for time for Parliament to define what the UK needs to aim for in negotiations with the EU. Corbyn’s grassroot supporters - the Labour members and supporters who voted him in - were strongly for Remain and many are genuinely disoriented by his failure. John McDonnell is widely perceived to have performed better, but his recent comment that free movement is over is also ringing alarm bells. This may seem to offer the way forward for the ‘coup’ now being organised against Corbyn, but he has not been the only one to let Labour down. There were some stirring Labour performances, for example by Sadiq Khan and Frances O’Grady against Boris Johnson and co. on ITV. But Labour often came over weakly - as in the unconfident and uninspiring contribution of new leadership aspirant Angela Eagle - thereby allowing others to make a stronger case. The Labour IN campaign was drab and directed too much at trade union activists, not the wider public. Deputy leader Tom Watson was virtually invisible. Former deputy leader Harriet Harman trailed David Cameron almost as closely as the unctuous Gisela Stuart trailed Boris Johnson, failing to make a strong independent case. 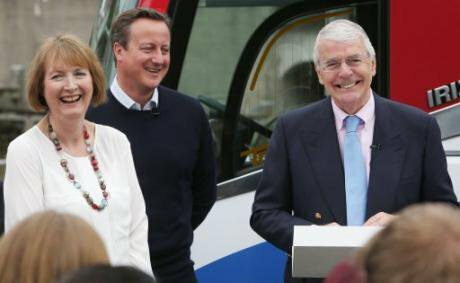 In a revealing moment, Harman joked with Cameron about Tory responsibility for the NHS crisis, instead of pressing the point home in a way that would have underlined the falsity of Leave’s claim to give £350 million a weak to the NHS. Overall, Labour - Corbyn and others - may have made enough noise to reinforce the inclination of most existing Labour voters to back Remain. Certainly the fact that SNP voters split for Remain by an almost identical 64:36, despite a much more coherent campaign, suggests that Labour’s weakness did not lose a lot of votes. However we shall never know whether a strong, assertive, united Labour campaign might have swung more voters Remain’s way. Worst of all, in the aftermath of the vote, Labour politicians have fallen over themselves to imply that we need restrictions on migration, which would mean abandoning the free movement of people. It is supremely ironic that many Blairite and Brownite MPs, who criticise Corbyn for failing to reach out to the middle ground, seem mainly concerned with protecting the UKIP flank. Leading figures across the board appear to be rushing to appease anti-migrant ex-Labour voters, but offer little to the upset, frustrated and angry 48 per cent. As anyone who has talked to Remainers knows, there are many who have previously voted Tory and Lib Dem who are desperate for leadership. This is probably the first opportunity since Blair’s disastrous Iraq venture fractured Labour’s support for Labour to reconstruct the alliance of left and centre which Blairites reminisce about. Many Remainers are so eager for someone to rally around that any Labour leader - even Corbyn - who stepped up would command attention. It is incredible that Labour should hand this opportunity to the Lib Dems. Labour does need, of course, to address its Leave voters and ex-voters, especially in the North, Midlands and Wales. But as the assassinated MP Jo Cox knew, it will not do this in a race to the bottom which UKIP will always win. Labour has a real UKIP problem, but it will deal with it by fighting UKIP, not following it. Labour needs to show that it has real answers to Leavers’ concerns. It needs to say that migration is not a numbers game, but about real people with families. It needs to put forward strong proposals for extra NHS, school, housing and other resources for communities most affected by immigration (Corbyn rightly made the point that the Tories had cut the special funding for these communities, but the case needs to be made strongly and positively). Labour needs also to point out to non-racist Leavers, and even soft racists, the shocking racist abuse and violence that the Tory and UKIP Leave campaigns have created. It is clear that in our first-past-the post electoral system, Labour needs to remain a coalition of left and centre-left if it is to ever win an election again. A split would let the Tories off the serious hook on which they have impaled themselves and could wreck Labour for decades - or even for good. It would be grossly irresponsible of either Corbyn and his supporters or the PLP majority not to look for genuine compromise, possibly along the lines of the deal apparently discussed last week. Labour’s leader cannot lose most of his MPs, but nor can the MPs afford to alienate the hundreds of thousands of new members and supporters who will be the key to Labour’s revival as a party. The EU referendum and its aftermath has shown that Corbyn is a weak leader, but it has also shown much of the PLP in a poor light. Labour needs to find a way of moving on without splitting, so that it can defend all that is best in our European Union membership as a Conservative government with a very shaky majority begins to deal with the mess that its leaders - Cameron, Osborne, Johnson, Gove and May - have created.